WhatsApp could put the brakes on Snapchat’s international growth with today’s launch of WhatsApp Status, a new tab for sharing decorated photos, videos and GIFs that disappear after 24 hours. It’s another Facebook-owned Snapchat Stories copycat, but the twist is that it’s end-to-end encrypted like WhatsApp messaging. Status could also open up new advertising opportunities for WhatsApp. If it followed Snap and Instagram’s lead, it could insert full-screen ads in-between friends’ Statuses. 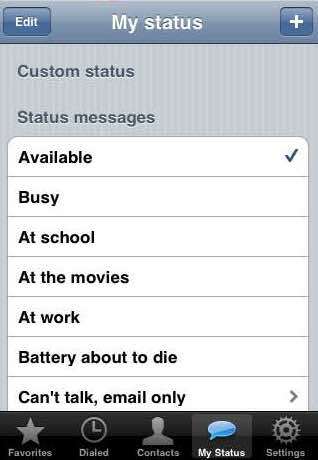 The new Status feature replaces WhatsApp’s old AOL Instant Messenger-style away messages. That was actually WhatsApp’s only feature when it launched almost exactly 8 years ago. “The original idea behind the project was to build an application that lets your friends and other contacts know what you’re up to,” CEO Jan Koum writes. But the company tells me it saw so many people quickly updating these statuses to communicate in real time that it pivoted to chat, but always kept the away Statuses. Now WhatsApp has 1.2 billion monthly users, with users sending 60 billion messages per day, including 3.3 billion photos, 760 million videos and 80 million GIFs. WhatsApp is parleying this success in messaging back into broadcast social media in a way that could spell trouble for Snapchat. If WhatsApp Status takes off, it could hinder Snap’s global growth opportunity in user-generated content, forcing it to rely on squeezing more cash out of existing users, or earning more revenue from hardware or professional content. Instagram Stories, now with more than 150 million daily users, showed how appealing a good-enough Snapchat clone conveniently bolted onto a popular app could be. TechCrunch first reported that Instagram Stories was stealing Snapchat usage and lowering its view counts, according to analytics providers and social celebrity managers. And Snap’s IPO filing showed a massive 82 percent drop-off in its user growth rate from 17.2 percent in Q2 2016 before Instagram Stories launched to 3.2 percent after in Q4. Instagram was bold enough to stick Stories in its main tab above its feed, while WhatsApp is burying Status a lot more in a separate tab. But Status has the opportunity to spread the Stories slideshow format to parts of South America, Eastern Europe and the developing world, where Snapchat doesn’t have strong traction yet. If these users aren’t already on Snapchat, they won’t even see Status as a clone. WhatsApp had been positioned as few-frills utilitarian chat while Facebook Messenger sported all the bells and whistles. But late last year, WhatsApp adapted to the visual communication age with the launch of additional camera features. Now the question is whether WhatsApp can eat some of Snapchat’s lunch abroad without watering down its core product.